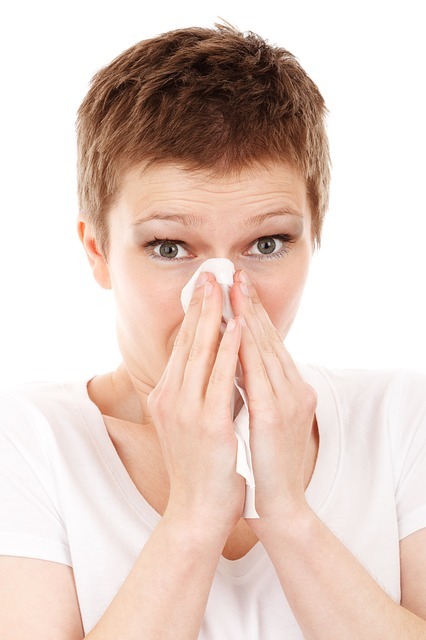 Sneezing occurs when irritants are sneak past our nose hairs. The nose hairs act like filters, capturing and trapping most of the particles that we breathe in. If something irritating like dust or a cold virus gets past this filter, a sneeze is initiated. A sneeze is a reflex that’s both awkward and elegant. Awkward because of the sudden, involuntary spasms it sends us into, and elegant because of the unified efforts of our nervous and muscular systems. Working together, our nerves and muscles can forcefully blast irritants right out of our system before they can take hold and make us sick. “Sternutation” is the scientific word for sneezing, derived from the Latin word “sterno,” which means stretching, spreading, or scattering. Some people experience “sun sneeze” when exposed to bright light. This is a genetic trait called ACHOO, which stands for Autosomal Dominant Compelling Helio-Ophthalmic Outburst Syndrome. “Snatiation” is a rarer form of sneezing triggered by a full stomach right after eating, another genetic trait. Why Do We Say ‘Bless You’ When Someone Sneezes? During the old ages, it was believed that one’s heart stopped beating when one sneezed. So if you are still alive after a sneeze, that’s because someone must have blessed you! It was also believed that sneezing was a way of ridding oneself of the Devil, so they said “God Bless you” to rid you of the Devil and keep evil spirits away from. Others believed that they were getting possessed by the demons so by saying “God bless you”, they were preventing evil from taking over their souls. This also originated from the common belief was that during a sneeze, the soul leaves the body and creates a vacancy for the Devil to swoop in. When someone in your vicinity sneezes, the Germans say “gesundheit“, giving a blessing of good health. The Polsh say “na zdrowie” and most The Romans would say “Jupiter preserve you” or “Salve,” which meant “good health to you” and the Greeks would wish each other “long life.” The phrase “God bless you” is attributed to Pope Gregory the Great, who uttered it in the sixth century during a bubonic plague epidemic, as sneezing is an obvious symptom of plague. North Americans’ “Bless you!” is believed it was brought to North America by German-speaking immigrants. in the early part of the 20th century. In India the response is by blessing the “sneezer” to live long; like in Bihar it is ‘Chattanji’, in Oriya it is ‘Buda/budi te hai tha’, in Tamil it is ‘nooru aayisu/ deerghaayisu’, in Kashmiri it is ‘Bismillah/ Kustaan chu yaad karan’. How and from where did the myth originate? The changing pressure in your chest due to sneezing changes your blood flow, which may change the rhythm of your heartbeat. The feeling that the heart comes to a stop during a sneeze may be from the sensation of a prolonged delay in the heart beat and one may feel that the next beat to be more forceful and more noticeable. Sneezes are an automatic reflex that can’t be stopped once sneezing starts. Sneezes can travel at a speed of 15 kmph and the wet spray can radiate five feet. People don’t sneeze when they are asleep because the nerves involved in nerve reflex are also resting. Some people sneeze when plucking their eyebrows because the nerve endings in the face are irritated and then fire an impulse that reaches the nasal nerve. Donna Griffiths from Worcestershire, England sneezed for 978 days, sneezing once every minute at the beginning. This is the longest sneezing episode on record. A sneeze itself is a mixed blessing. Though a sneeze protects the sneezer, it can make other people sick. When you sneeze, you blast all those bacterial droplets into the air and onto the skin and tissue of anyone in the vicinity of the sneeze. Cover your mouth to catch a sneeze before it gets to someone else. Sneezing into a tissue is best. If you don’t have tissue, try not to use your hand to shield the sneeze. Rather, aim for the inside of your elbow or into the crook of your shoulder. You’re less likely to touch keypads, doorknobs and drawer handles with those parts of your body. If you sneeze in your hand, make sure to wash with soap and water or use a hand sanitizer before touching other things. It’s hard to avoid all sneeze triggers, especially during the contagious cold and flu season. Covering up with scarves or face-masks is how some people defend their noses. Avoid sneeze generators like pets and try not to go out much on high pollen count days. A polite “excuse me” doesn’t hurt after you’ve had a loud sneeze fit in a public place. When it comes to “blessing” someone after a sneeze, keep in mind that different parts of the world recognize different customs. In South India, a single sneeze indicates that someone’s taking about you and two sneezes means someone’s thinking about you- most likely your mother-in-law. In North India, a single sneeze indicates bad luck, if you sneeze twice it’s good luck. If you’re about to do some chore or thinking of it and you sneeze once, don’t go as you may not achieve the desired result or something bad may happen. Of course if you sneeze twice you should go and if you sneeze an odd number it’s also bad luck. According to a Chinese superstition a sneeze on New Year’s Eve is ominous for the coming year; and to offset this, the sneezer must visit three families of different surnames, and beg from each a small tortoise-shaped cake, which must be eaten before midnight. The Japanese attach significance to the number of times a man sneezes. Thus, one sneeze indicates that some one is praising him, while two betoken censure or disparagement or gossip; a triple sneeze is commonplace, and means simply that a person has taken cold. In Mexico, also, it was formerly believed either that somebody was speaking evil of one who sneezed, or that he was being talked about by one or more persons. Sneezing is a lucky charm for the French. when one sneezes, they say ‘May your dreams come true’. Three sneezes in succession in Holland means its going to be a sunny day tomorrow. Sneeze on Monday for health. Sneeze on Tuesday for wealth. Sneeze on Wednesday for a letter. Sneeze on Thursday for something better. Sneeze on Friday for sorrow. Sneeze on Saturday, see your sweetheart tomorrow. Sneeze on Sunday, safety seek. May God bless all of you all every time you sneeze. God bless you; just keep up the creative work. Bless You. Incidentally in Andhra too one sneeze when you are about to leave for an important , people stop for some time may be a glass of water and then commence! I do not know how much it is true, that sneezing is infectious. Many a time one sneeze from a person in a group may set off another person to sneeze. Someone advised a method to control sneezing by biting one’s lower lip. Can be tried out how successful it is.